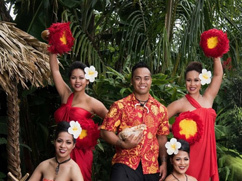 A captivating atmosphere of music and dance with aromas of spices and orchids are sure to whisk you away to a time of legendary Polynesian culture. 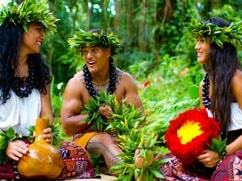 We've gathered the best luaus on Hawaii that are sure to be the highlight of your amazing tour of the Hawaiian islands. 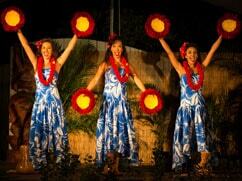 Choose one of our Hawaii Luaus on Oahu, Maui, Kauai, and the Big Island! Your taste buds are going to explode with a variety of delicious traditional Polynesian fare like lomi lomi salmon, the famous kalua pig, prim rib, chicken and rice dishes. Sit back and enjoy views of the crystal clear blue waters of the Pacific Ocean and the lush green vegetation of Hawaii's exotic plants. Then prepare yourself for stunning sunset backdrops as the ceremonies begin. 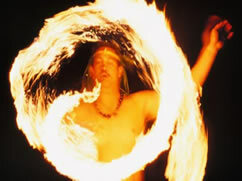 Aloha and welcome to the tradition of Fire and Ceremonies made of Legend! Create your own legend on your next Hawaiian vacation. 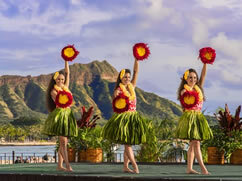 Encompassed by the sweet mesmerizing sounds of the islands and the performances of a luau there will be no shortage of food as you feast upon a meal fit for a King and Queen. A luau is a traditional Hawaiian feast accompanied by live entertainment and often times also cultural presentations and games. 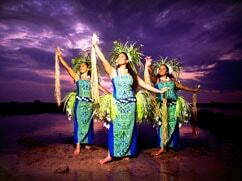 Attending a luau while in Hawaii is a must to experience the island culture and the spirit of aloha. Most luaus feature the traditional imu ceremony, in which the kalua pua'a (roast pig) is revealed from the earthen oven, where it has been slowly cooking for several hours until perfection. 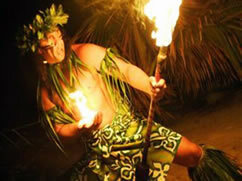 Other luau activities may include hands-on arts and crafts and fun island games. Learn how to make a flower lei or a head band. Take a ukelele or hula lesson or participate in a pineapple toss or a conch shell blowing challenge! Witness an impressive torch lighting ceremony and the arrival of the Royal Court. Depending on which luau you choose, you can enjoy a few of these and other activities. Bring a big appetite because attending a Hawaiian luau means feasting on a variety of delicious foods, from traditional Polynesian fare, such as lomi lomi salmon and kalua pua'a (roast pig), to prime rib, chicken and rice dishes for those whose taste buds are more accustomed to continental American delicacies. A Hawaiian luau is also your chance to try poi, a Hawaiian staple made from the underground plant stem of the taro plant. The plant stems are first cooked and then mashed until the dish has the desired consistency, which can range from liquid to dough-like depending on how much water is added. Another traditional luau food is lau lau, a dish where beef, pork, chicken or fish is wrapped and then cooked in taro leaves. For dessert, most luaus typically feature scrumptious cakes, cookies and haupia, a coconut pudding. 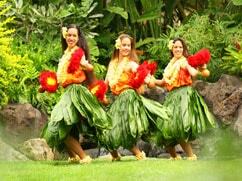 After the big luau feast, sit back and enjoy traditional Hawaiian chants, dances and music. 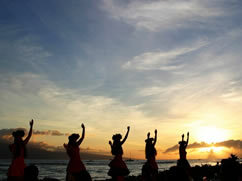 Watch mesmerizing hula dances, which might include hula kahiko (ancient hula) or hula 'auana (modern hula). The ancient form of hula is different from the modern version in that it does not include modern instrumentation, such as guitar and ukulele. While modern hula still tells a story like hula kahiko does, it also shows Western influences. 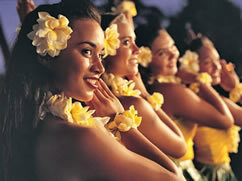 The hula songs generally feature a lead voice and are sung as if they were popular music. Acoustic stringed instruments also come into play. Another difference between the two hula styles is that the ancient hula is always performed with bare feet, but the modern hula can be performed with bare feet or shoes. 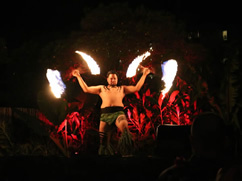 Hawaiian luaus also showcase dances from other Polynesian island nations, such as the exciting Samoan fire-knife dance and the Maori war dance. Held under the stars on a private beach on Oahu’s southwestern shore, Germaine’s Luau offers a laid-back, casual atmosphere. A great luau for the whole family. Free transportation now included! Come experience Hawaii's only Farm to Table luau! Located on a grassy oceanfront lawn at the Waikiki Aquarium, the Diamond Head Luau is within walking distance of all the major Waikiki attractions. Spend an entire day at this popular cultural park. 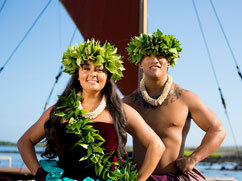 Learn about Polynesian culture, watch arts and crafts demonstrations and experience a traditional Hawaiian luau. The Waikiki Starlight Luau takes place right in the middle of Waikiki, at the Hilton Hawaiian Village’s Rooftop Garden. 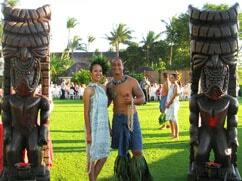 Held at beautiful Waimea Valley on Oahu's North Shore, Toa Luau invites you to an evening of celebrating Hawaiian culture. What makes this Hawaiian luau unique is that it includes same-day admission to Waimea Valley, home to a botanical garden. Held at the historic Nutridge Estate inside of the Pu'u 'Ualaka'a Wayside Park, Nutridge Luau offers a truly magical 5-star experience. This Hawaiian luau features a unique setting unlike any other – it is situated on Mount Tantalus. Join the newest luau on Maui for an evening celebration of Momi 'O Ka Pakipika, Hawaii the pearl of the Pacific, through music, dance and dinner! Enjoy the luau show with the backdrop of the Pacific Ocean. 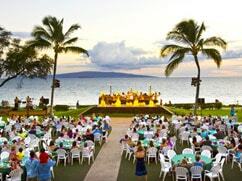 Experience a traditional Hawaiian luau in Grand Wailea style! This Maui luau is held oceanfront and features fantastic sunset views. 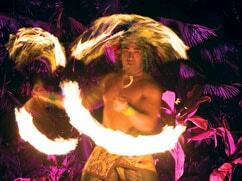 Held outdoors right on Ka'anapali Beach, the Wailele Polynesian Luau features a stunning oceanfront backdrop. 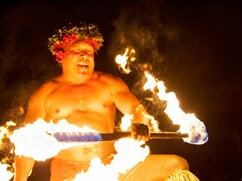 Highlights of this Maui luau include the story of the fire goddess Pele, Hawaii's volcano goddess. 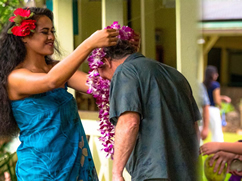 Participate in Hawaiian arts and crafts and experience an authentic Hawaiian imu ceremony. 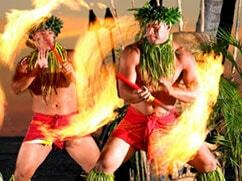 Then enjoy a delicious luau buffet and an exciting Polynesian show! Enjoy Hawaiian arts and crafts demonstrations and witness traditional imu underground oven cooking. 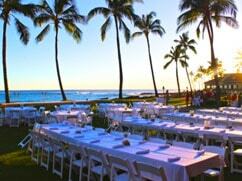 This Maui luau also features a delicious all-you-can-eat luau buffet and an open bar. The Old Lahaina Luau takes great pride in presenting a traditional Hawaiian luau - an evening of traditional Hawaiian cuisine, music, cultural dances and island crafts. Situated along the beach in historic Lahaina Town, Feast at Lele features an intimate setting with mesmerizing views of the West Maui sunset, plus an amazing menu! 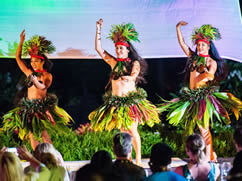 Luau Kalamaku offers twice as many dancers and entertainers than any other luau on Kauai. Watch traditional Hawaiian arts & crafts demonstrations and enjoy the delicious luau feast, which is followed by an exciting Polynesian show. 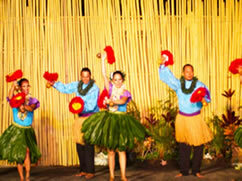 Experience a traditional Hawaiian luau in Grand Hyatt Kauai style! 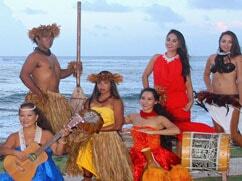 Enjoy a delicious Kauai luau feast and a Polynesian show, including hula dancing. The Luau Moana Aloha is held on the lawn of Koloa Landing resort features an outdoor paradise with soft ocean breezes and swaying palms.